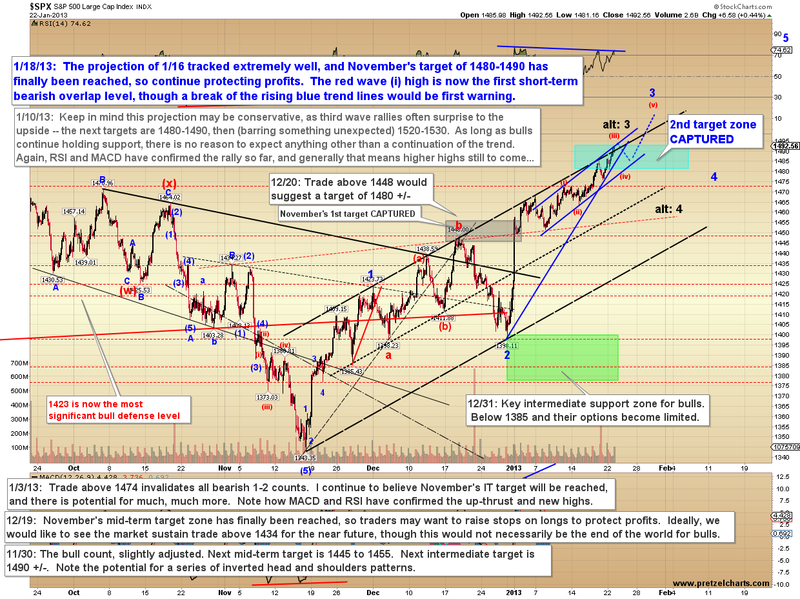 The rally has, so far, continued largely unabated, which is what I expected on January 2. As I warned at the beginning of the year, this rally appeared to fall in the third wave position, which meant to watch for upside surprises and little in the way of downward corrections. Third waves are powerful trending waves which, as obvious as it sounds, are simply "done when they're done." The key to trading them is to accurately recognize their potential ahead of time (which we did) and trade accordingly -- and not fall into the trap of calling tops the whole way up (or bottoms on the way down). So with this wave, I'll continue to look upwards until the wave structure actually turns and suggests we shouldn't (our first warnings will be a five-wave impulsive decline and some key trend line breaks). The S&P 500 (SPX) is in an interesting position, as it's broken-out ever so slightly above the black trend channel. This could indicate the current wave is close to exhausting its thrust -- or it could indicate renewed energy... time will tell. The first key that would suggest at least a near-term correction would be breaks of the two lower blue trend lines. The Russell 2000 (RUT) is in a very interesting position for the long term. It's rallied to within a few points of the invalidation level of the most immediately bearish long-term count, and a break above 902.30 will suggest the bulls have at least several months-worth of firepower left, if not a great deal more. The problem here for bears is that if 902.30 is exceeded, then that would make red wave iii the shortest wave -- and the third wave can never be the shortest, so that would invalidate the most bearish count. A further breakout over the upper blue trend line could see the rally extend by 15% or more. In conclusion, there's still no reason to be anything but bullish at present. All of my intermediate targets of the past several months have now been reached (across most indices), so I'm waiting to see how the market responds here before generating new targets. 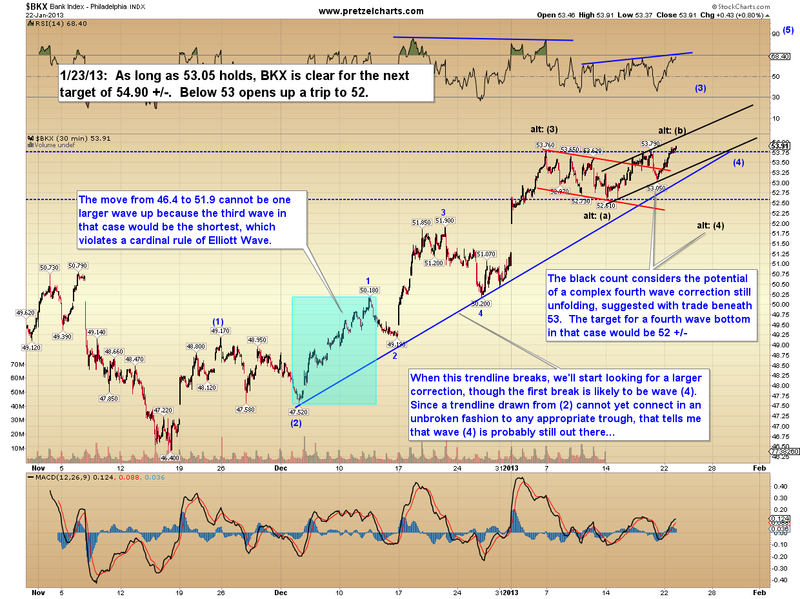 In the meantime, the simple approach is often best during third waves... in other words: the trend is still our friend. Trade safe. 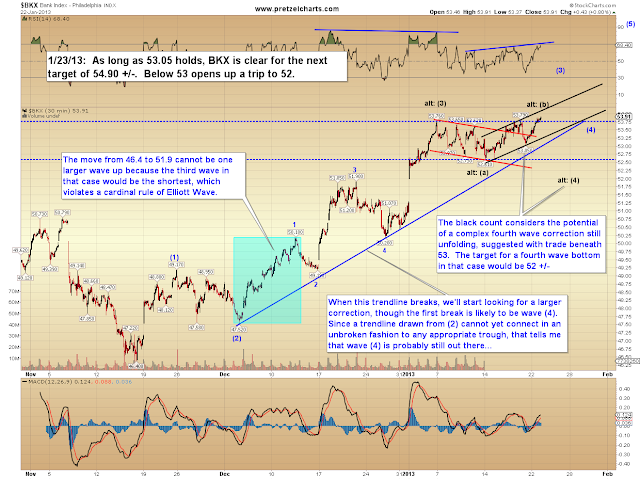 the bullish case looks likely. 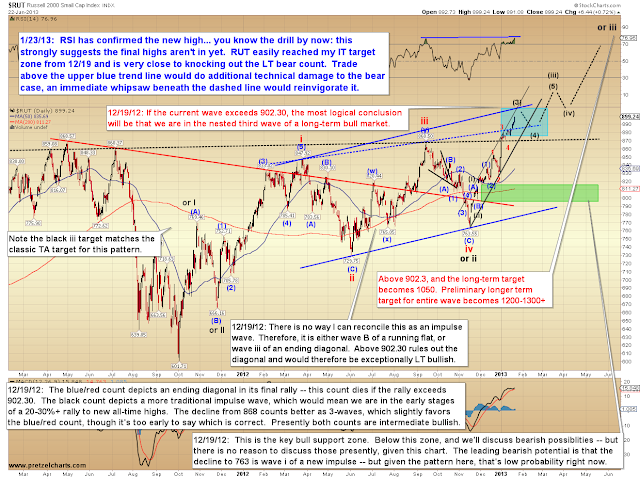 my cycle guys say a correction into mid Feb and a STRONG rally into early summer/late spring. however there will be downward pressure after that peak is made and the 4 yr cycle low should come into play - a 35% decline or so.